Yes, I know, Easter is over. And I don’t think they have parades at Easter, anyway. At least not in this country. 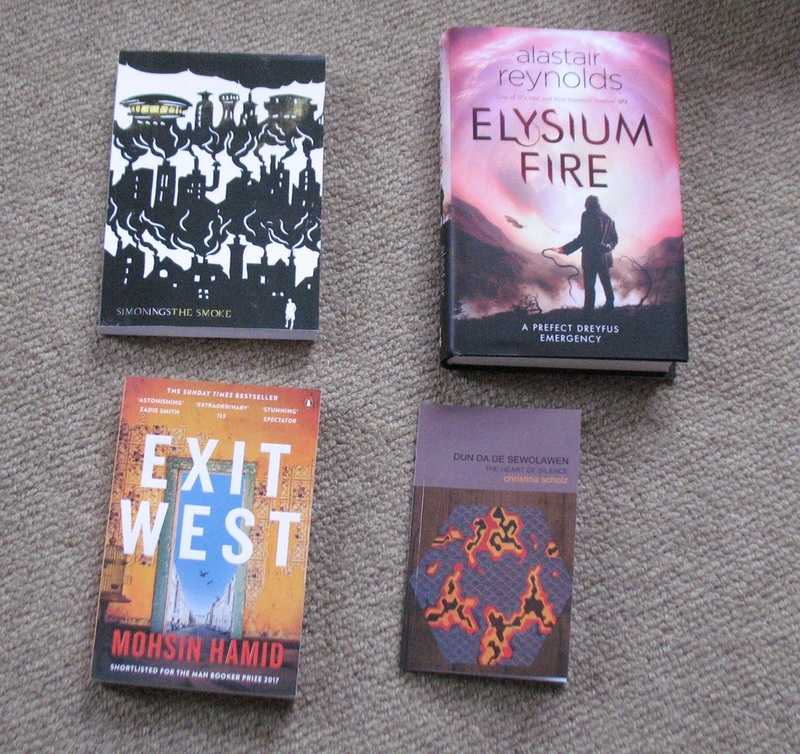 But it’s still April, and here is a parade of books wot I have recently added to the collection. 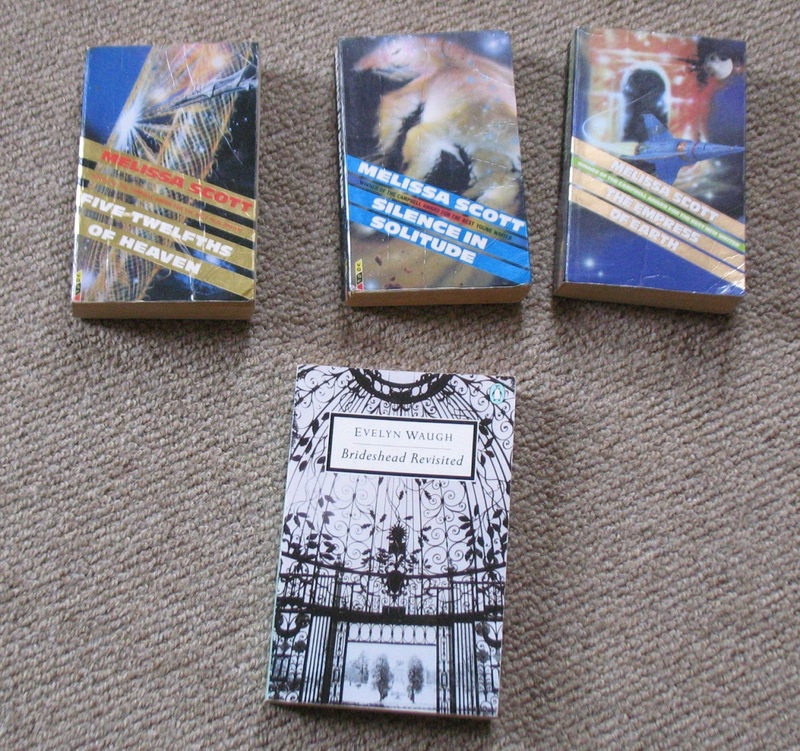 This is the third set of novellas from NewCon Press – I didn’t bother with the second set as it was horror – and, as you can see, the covers form a single piece of art. By Jim Burns. I’ve already read The Martian Job (see here), and The Martian Simulacra and The Greatest Story Ever Told (see here), but have yet to read Phosphorus. 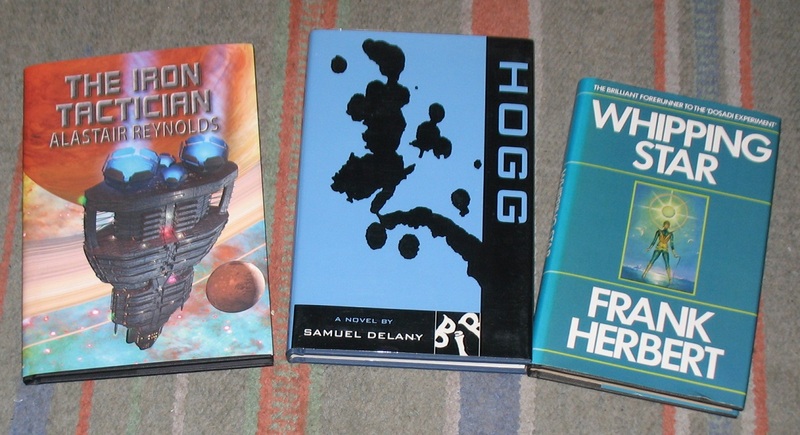 Three new-ish science fiction books. 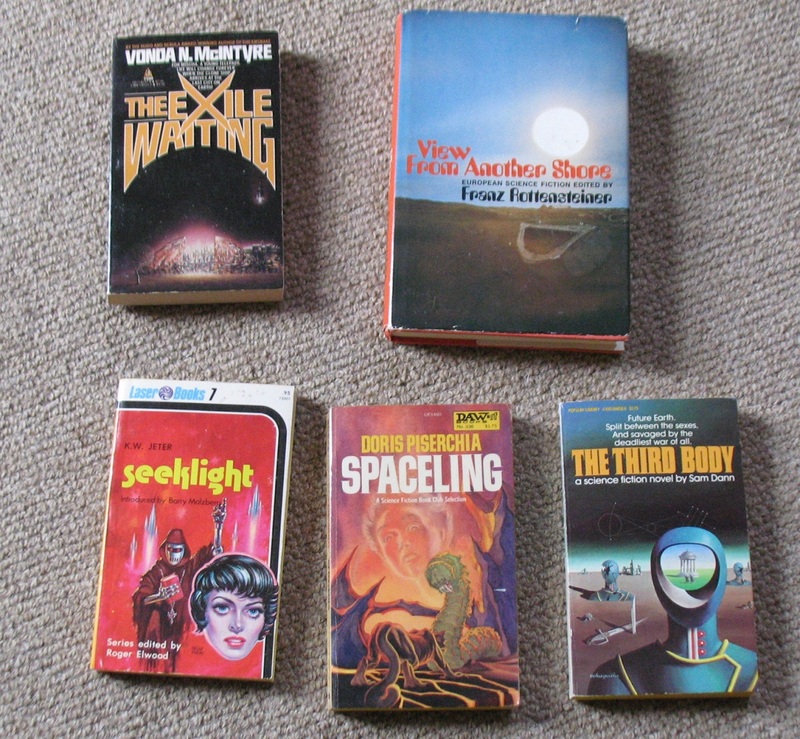 Well, A Thorn in the Bush is not really new – it was written decades ago but never published – and it’s not actually science fiction either, as Herbert initially set out to be a writer of thrillers. But never mind. 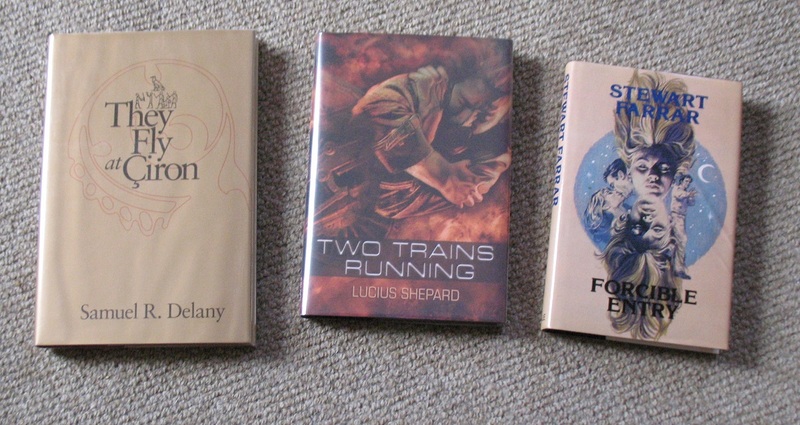 Songs of Leaving was the only book I bought in the dealers’ room at Follycon 2. I’m a big fan of Duchamp’s writing, so I’ve been after a copy of The Waterdancer’s World for a while. 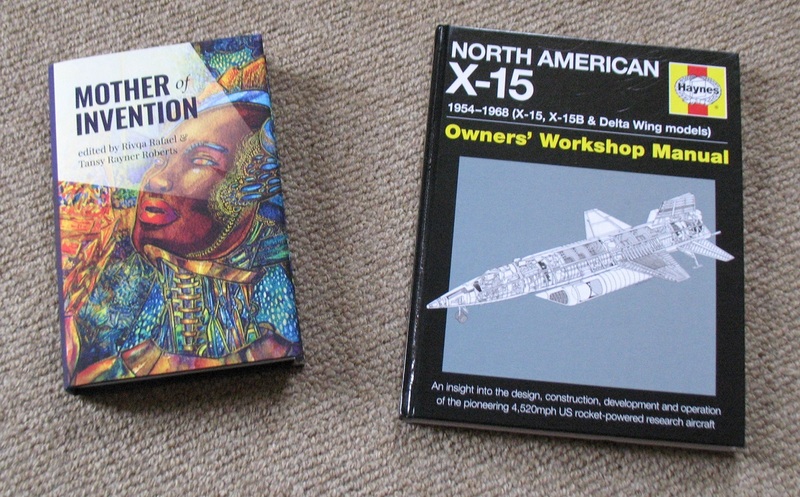 Some birthday presents from last month from my sisters. I’ve heard good things about Frankenstein in Baghdad. A Primer for Cadavers I’ve already read (see here). 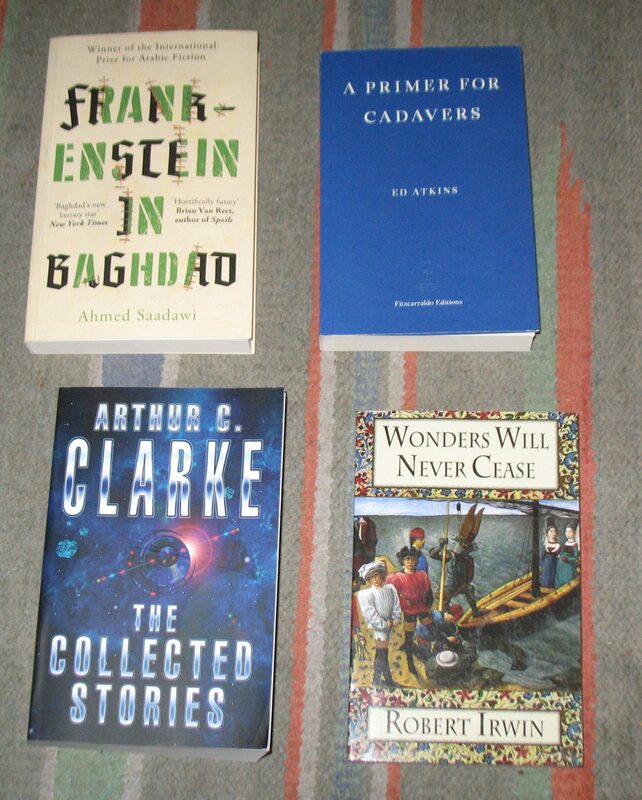 I’ve always wanted to work my way through Clarke’s short fiction, so I’m glad I now have The Collected Stories. And I’ve been a fan of Irwin’s writing since reading his book on classical Arabic literature years ago, and Wonders Will Never Cease is his latest novel. Some collectibles. 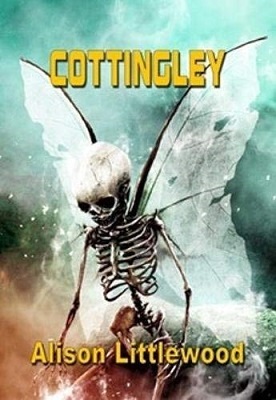 The Elizabeth A Lynn is actually titled Tales from a Vanished Country, although none of the books in the 29-volume Author’s Choice Monthly series from Pulphouse Publications actually put the titles on the cover. Anyway, I’m slowly completing the set. The Natural History of the P.H. is an essay by Roberts on something that drove his fiction in his later years. It was published by Kerosina. 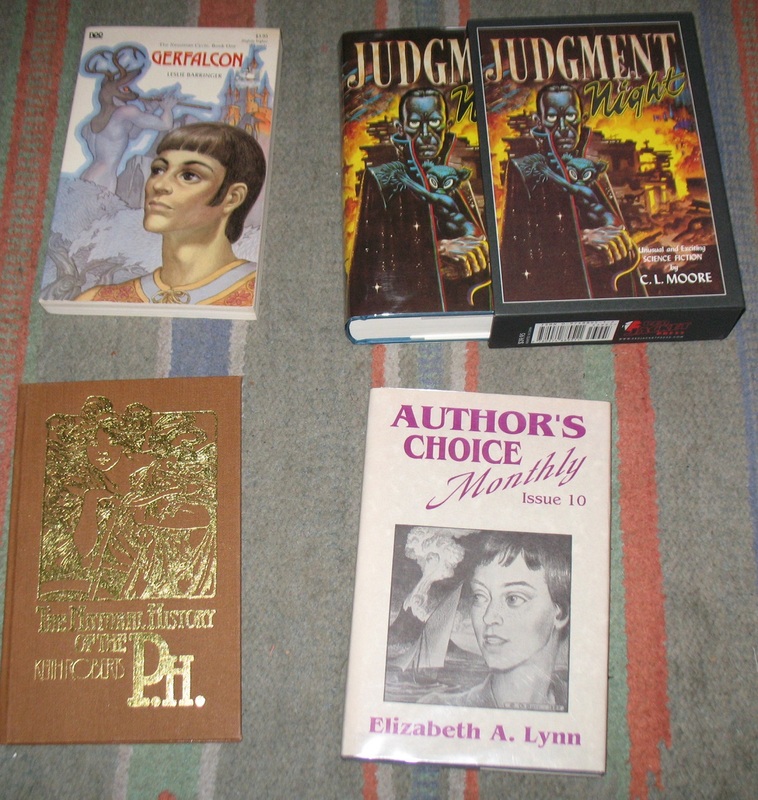 Judgment Night is a facsimile edition of the first edition, published by Red Jacket Press. 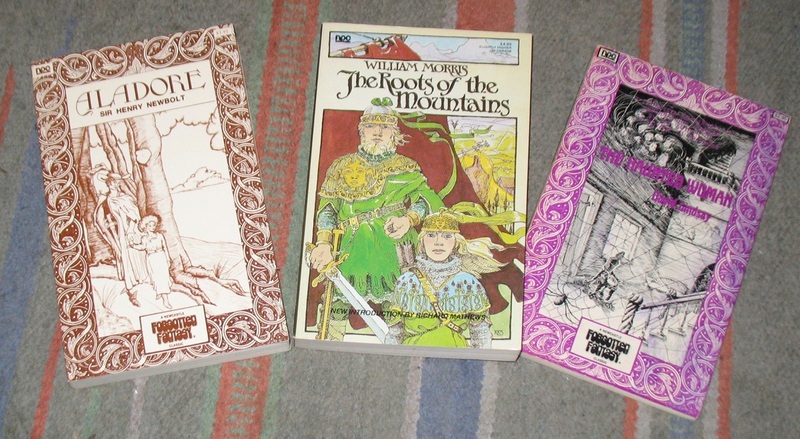 Gerfalcon, is from the Newcastle Forgotten Fantasy Library, although annoyingly I don’t think it’s the original cover art for the book. 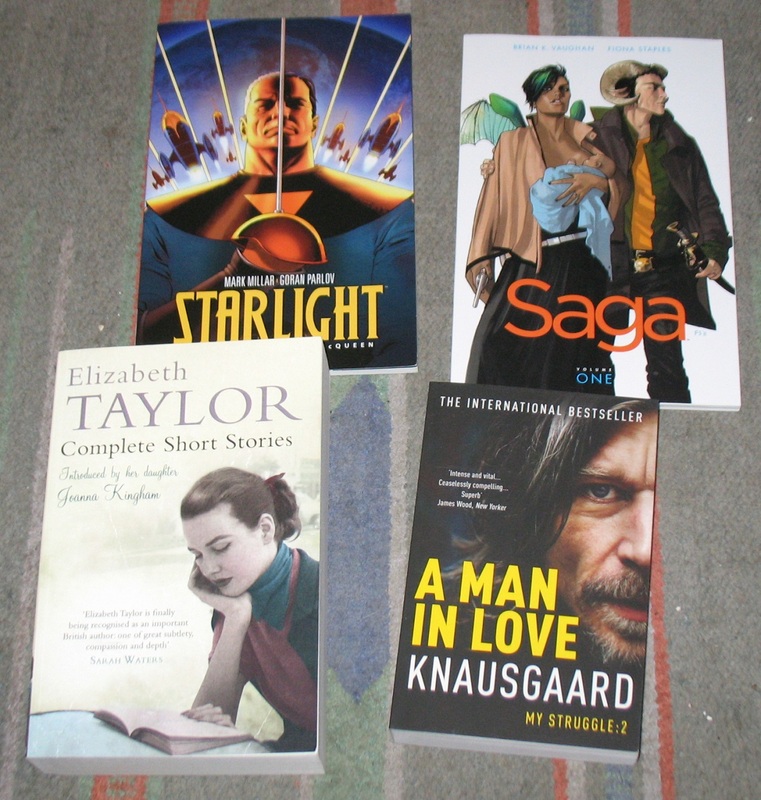 Finally, some graphic novels. 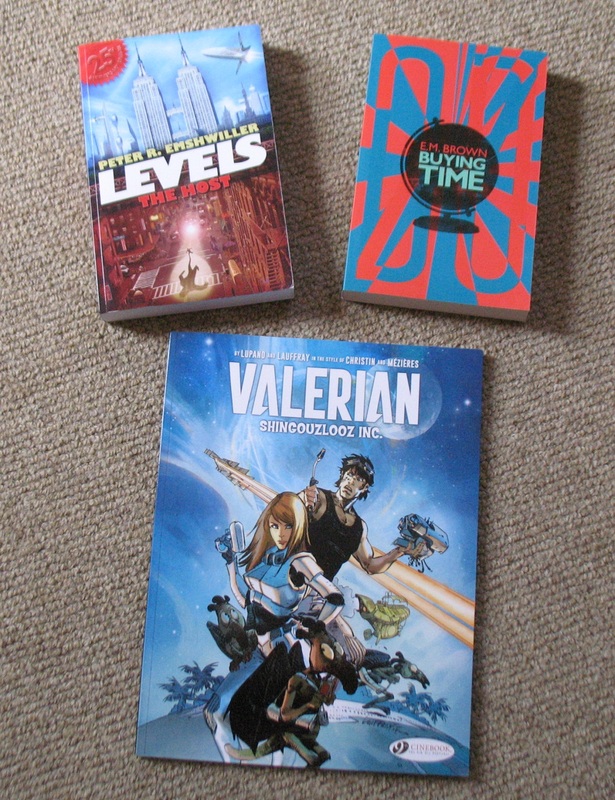 Memories from the Future (see here) is the final volume in the Valerian and Laureline series. 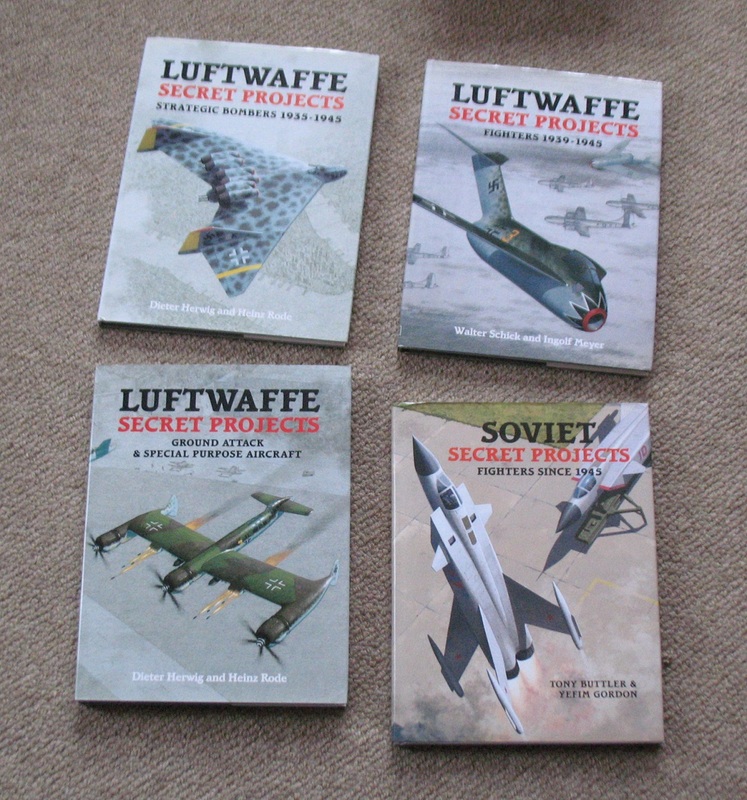 While Crosswind (see here) is the first volume in a new series. 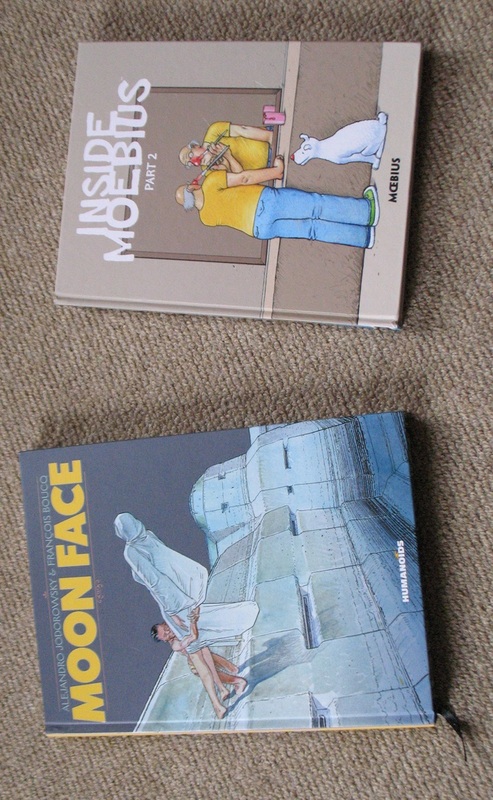 And Inside Moebius Part 1 is, er, also the first in a series, of, I think, three volumes. Categories: book haul, books | Tags: ahmed saadawi, arthur c clarke, cat staggs, cl moore, dh lawrence, ed atkins, elizabeth a lynn, frank herbert, gail simone, jean-claude mézières, keith roberts, l timmel duchamp, leslie barringer, lois gould, moebius, pete crowther, pierre christin, robert irwin, toby litt, tove jansson | Permalink. 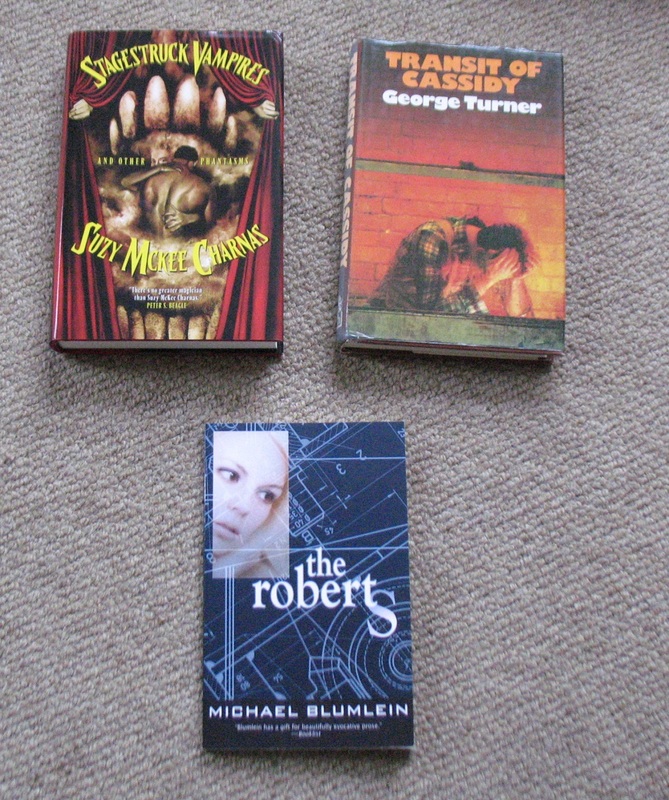 I’m not sure what’s been going on with my reading recently. 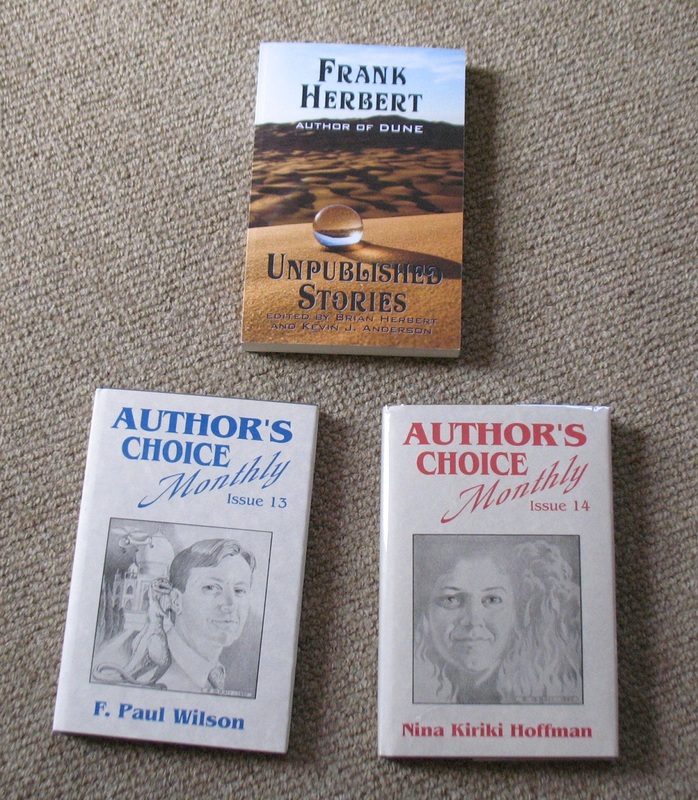 I usually alternate genders in my fiction reading, but I seem to have had a run of male authors. I’ll probably make up for it before the end of the year. The Hollow Man, John Dickson Carr (1935). Whenever I spot one of these Crime Masterworks in a charity shop, I pick it up. 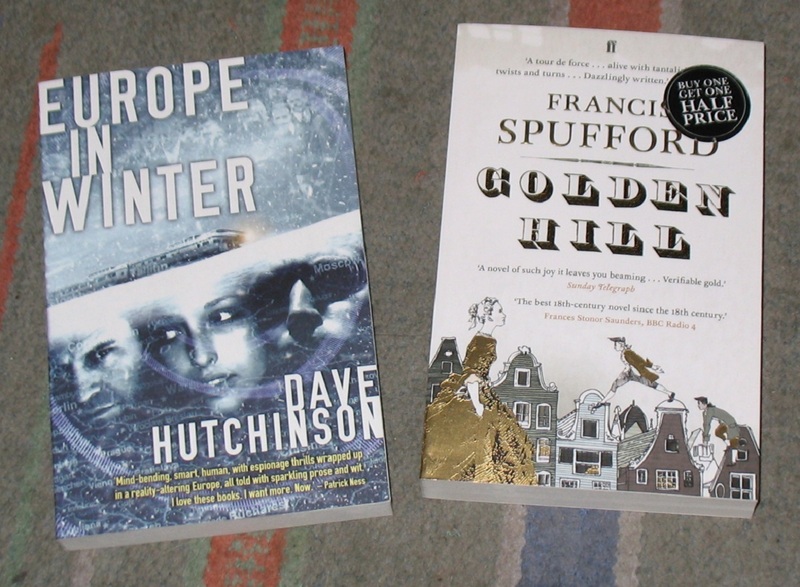 I’m not a big fan of crime fiction, although it does seem many sf fans are, and when I do read crime I tend to stick to a handful of favourite authors, like Sara Paretsky or Sue Grafton. 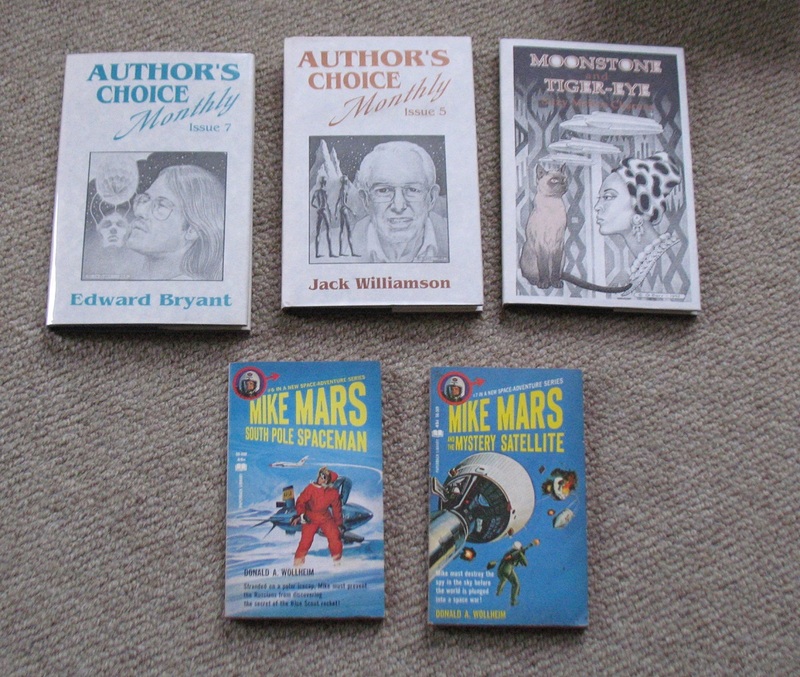 But some of the classic stuff makes for an easy light read, along with the sf, amongst all the literary fiction I seem to mostly read these days… I’ve read Dickson Carr before – I seem to remember buying one of his books at a remainder book shop in Abu Dhabi during the 1990s – but I couldn’t tell you anything about him or his oeuvre. 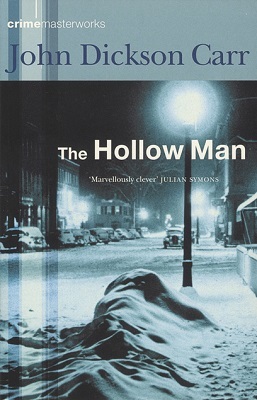 The Hollow Man was apparently voted the “best locked room mystery of all time”, so it comes as no surprise to discover its one of those completely contrived murder mysteries which are set up in order to make the protagonist – eccentric detective Gideon Fell, who is based on London – appear enormously clever. The Hollow Man is split into three sections. In the first, an emigré professor is threatened in a pub, and then is later murdered in his room after admitting a stranger – but when the locked door is forced, the stranger has vanished and there’s no other exit. In the second section, the chief suspect is then shot in the middle of an empty street, with no visible assassin, by witnesses. The final section reveals the back-history of the two dead men (they were brothers) and Fell explains, with diagrams, how both murders were committed. 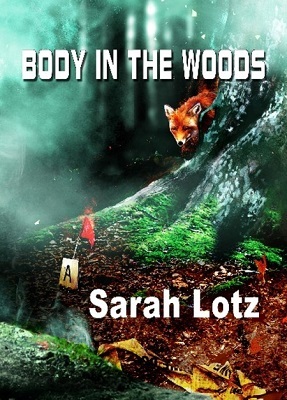 The first was deliberately contrived to be a locked room mystery, the second only became a mystery through a sequence of unlikely events. 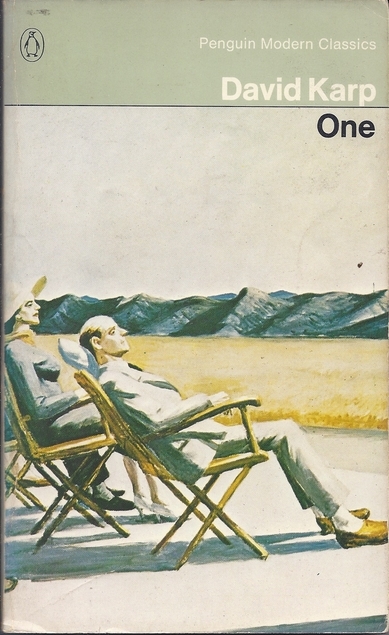 Although set in London, Dickson Carr completely fails to evoke time or place, and most of the characters are painted very broadly. It’s a mildly entertaining, but slight, intellectual exercise, and requires about as much suspension of disbelief as your average space opera. The Sign in the Moonlight, David Tallerman (2016). I was given a copy of this by the author, and I’ll freely admit horror, or dark fantasy, is not really my thing. Even so, if there was one thing which jumped out at me about the stories in this collection, it’s that they pastiched their inspirations a little too effectively. In fact, for much of the collection, it felt like the author had no voice of their own. Granted, it takes good craft to pastiche so effectively, and in an individual story read in, say, a magazine or anthology, it wouldn’t present a problem… but in a collection of such stories, you start to wonder who has actually written them… I wasn’t as taken with the Lovecraft-kiddie story, ‘My Friend Fish Finger By Daisy, Aged 7’, which I first heard at a York pub meet, as much as I know others have been; and I thought the title story, an Aleister Crowley story, suffered from a lack of, well, Aleister Crowley… although I thought it quite effective otherwise. 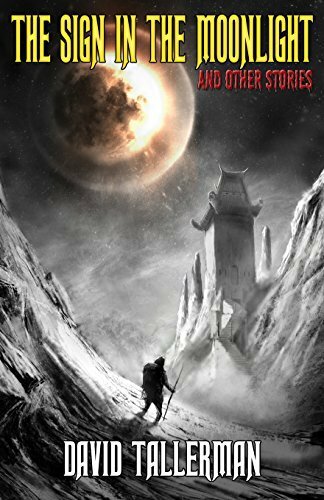 The stories are, on the whole, well-crafted and polished, and wouldn’t look out of place in any random Weird Tales sort of anthology or magazine. The collection is also very nicely illustrated, with a page of art introducing each story. But for me, that lack of a voice felt like a deal-breaker, and it all seemed somewhat too polished, so your attention tended to slide from the prose. 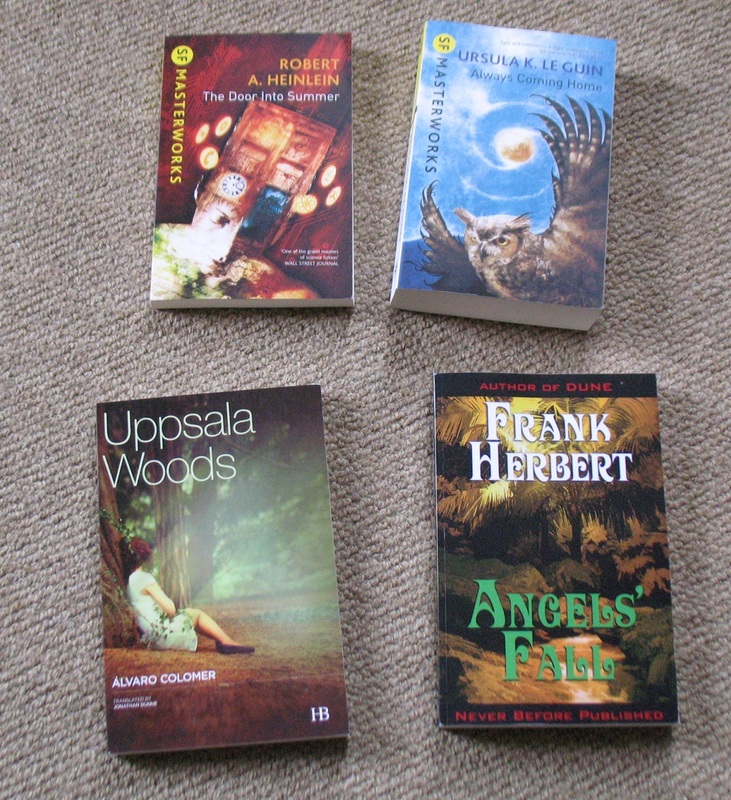 It has occurred to me that short stories succeed when they contain a high concept conceit that resonates with readers or a strong voice – and the best stories have both. In terms of strong conceits, some of the stories in The Sign in the Moonlight get close, and in isolation those conceits might have seemed stronger. 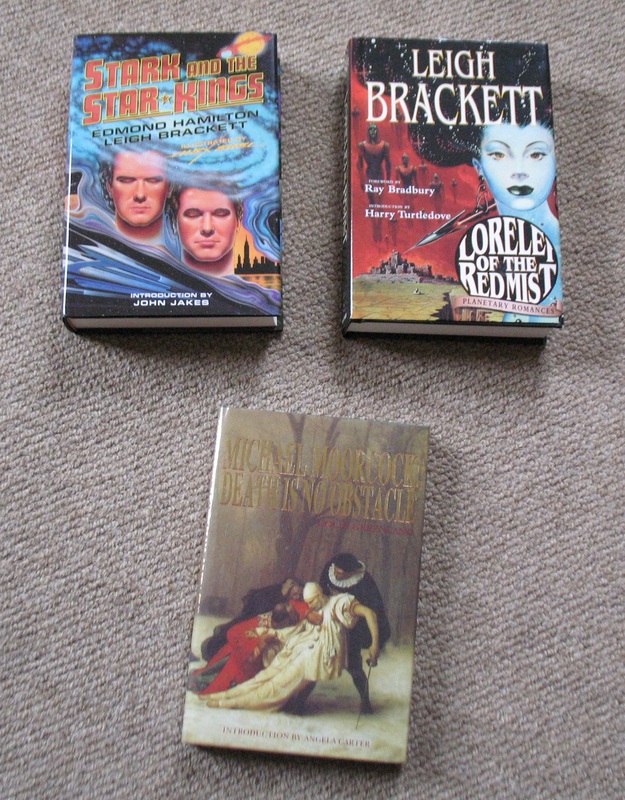 I’ve always liked collections, I much prefer them, in fact, to anthologies… but reading this one made me think about why I prefer them, and why some are more successful than others. 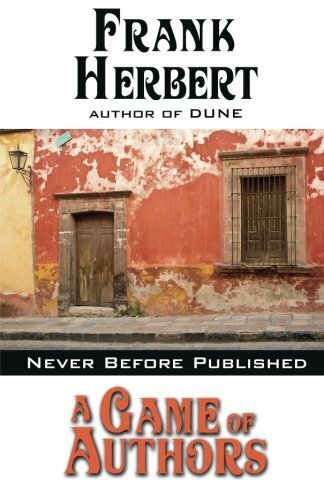 A Game of Authors, Frank Herbert (2013). Of course, Frank Herbert didn’t write this novel in 2013. WordFire Press – better known as Kevin J Anderson – has been publishing Herbert’s previously unpublished work, and this mainstream thriller is one of those. And I can see why it never saw print back in the day. A journalist is sent a letter in broken English which reveals that a long-missing Pulitzer Prize-winning author is hiding out in Mexico. The journalist persuades his paper to let him check it out… but it’s all a plot by the missing author, who has been imprisoned in a hacienda, with his nubile daughter, by the head of the local communist cell, because the author has been writing propaganda stories for them and selling them under pseudonyms to US slicks. The writing in A Game of Authors is definitely Herbert’s, but it’s much cruder than his later work and some of the dialogue is embarrassingly bad. The Mexican characters are all stereotypes, and the communist conspiracy plot is too weak to justify the violent showdown which results. 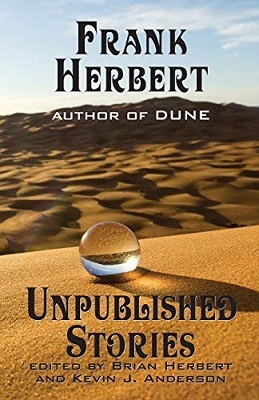 If you’re interested in Herbert’s career, A Game of Authors might be worth a read; but letting it see the light of day will not do his reputation all that much good. One, David Karp (1953). 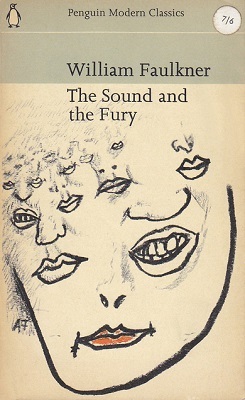 This was from my father’s collection of Penguin paperbacks and, despite being a literary dystopia, it wasn’t a novel I’d heard of until I came across his copy. I mean, I’ve read Nineteen Eighty-four and Brave New World and I’m aware of We and ‘When the Machine Stops’… but I don’t recall ever seeing mention of One in discussions of dystopian fiction. Has it dropped out of favour? 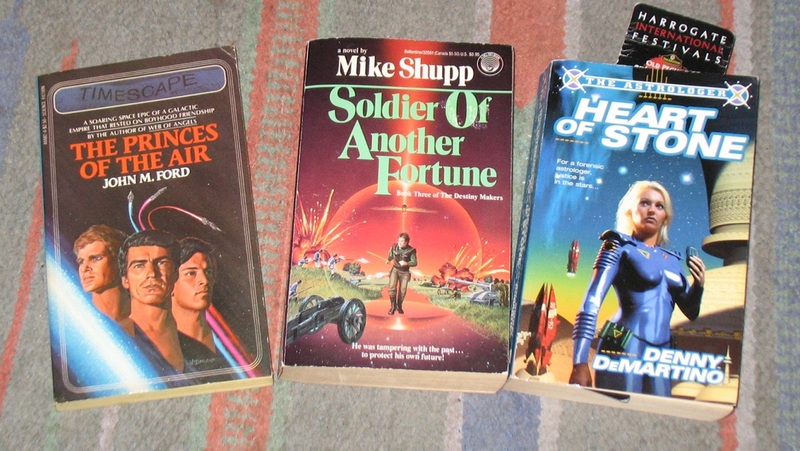 Is it considered not sfnal enough to mention in discussions of dystopias? Because it’s a damn sight more science-fictional than Nineteen Eighty-four. (And is no longer in print, I see.) A couple of centuries from now, the “benevolent State” rules the entire planet. A college professor is a secret informer for the State and writes regular reports on his colleagues and students. But then he is called in for a random check, mistakes his interview with the Department of Internal Examination as an indication the department is about to reward him for his diligence, and so reveals himself to be a “heretic”. But a senior member of the department believes heretics such as the professor are curable, and tries to do so. (Normally, they’re simply executed.) The professor is brainwashed and rejoins society under a different name and with an entirely different personality. 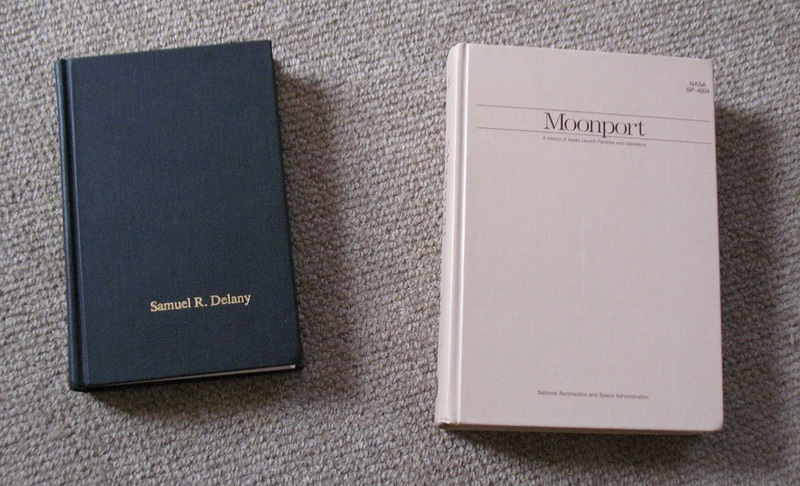 But his subsequent behaviour, although he appears to be a model citizen, reveals that his heresy has not been completely eradicated… Clearly, the 1950s US fear of communism is the driving force behind the world and plot of One, but such novels reveal more about the flaws of the writer’s society than they do those of their invented dystopia (hello there, Fahrenheit 451). The benevolent State is crime-free and the vast majority of its citizens are happy. Why is this a bad thing? A handful of malcontents who believe their dissatisfaction is a result of their “individualism” being curtailed is no reason to write off the entire society. But, of course, that’s how dystopian fiction works. It reinforces present-day values by valourising one single aspect of the writer’s society that a “dystopia” might diminish, while ignoring all the social problems said dystopia might actually fix. Obviously, the USSR was far from a utopia, but at least it tried to become one – which is more than can be said for the US (or indeed most nations). 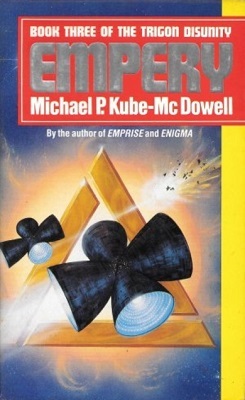 One has its flaws – it’s simplistic, it’s all a bit men-in-hats sf, and its prose is functional rather than evocative (although better than most sf novels of the time). It also makes a meal of the whole “individualism” thing, when it actually does a better job of disproving the need for it. It’s still worth reading. Mars 1999, Brian O’Leary (1987). 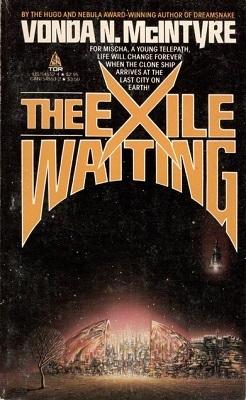 I bought this a few years ago when I was collecting books on missions to Mars, and while its title alone indicated it was now alternate history, I hadn’t expected it to posit such a, well, utopian vision of the early twenty-first century. It’s all very well imagining NASA will expand their space programme and put together a mission to Mars. It’s even plausible such a mission might be a joint mission with the USSR (because, of course, in 1987, everyone thought the Soviet Union was still in rude health). But it’s a frankly bizarre stretch to think that a US-USSR mission to Mars might lead to a world government two decades later… O’Leary covers some of the necessary science in basic fashion, then documents the design of spacecraft which would be used in his preferred mission plan (including some not very good illustrations of the spacecraft), and even intersperses his discussion of his topic with short chapters of a fictionalised mission featuring an international crew. Well, not precisely international – there’s a Soviet spacecraft and a US spacecraft travelling in formation, but the US crew is not entirely American. The commander is, however. And another American in the crew gets to be the first human being to step onto the Martian surface. 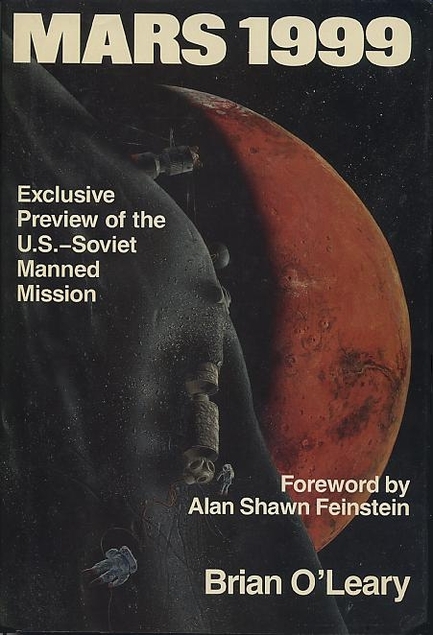 I didn’t read Mars 1999 looking for a fictional treatment of the first mission to Mars, but I was expecting something a little heavier on the science and engineering that what I found. I suspect the book was among the first on its topic to be published, so all due credit to the author, but thirty years later it reads like, er, science fiction, or alternate history. 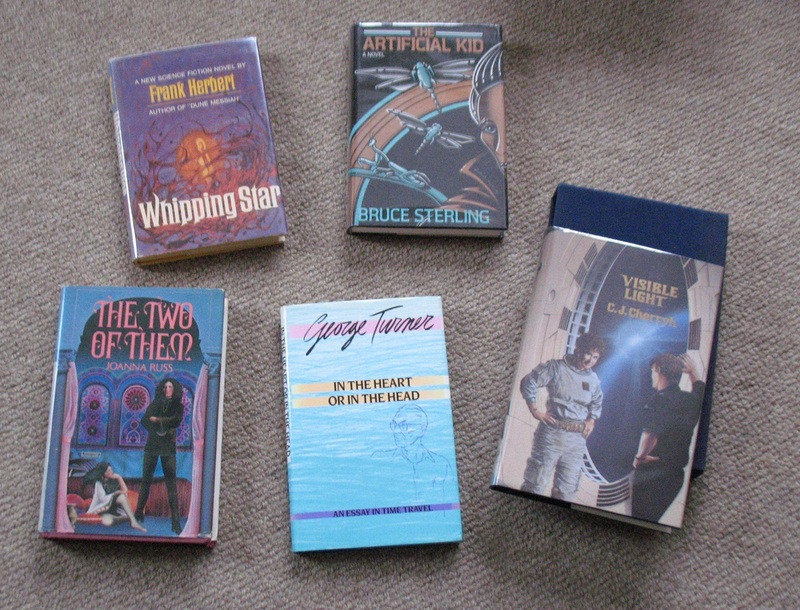 And not particulary good science fiction or alternate history. One for those interested in the topic, I suspect. Labyrinths*, Jorge Luis Borges (1962). I had a copy of this years ago but it seems to have gone missing at some point, and I’d never got around to reading it. So I bought a replacement copy, and ended up reading it a couple of weeks after it had arrived. There’s not much you can say about Borges or this collection – either you know what he writes, or you don’t, because explaining it is pretty difficult. 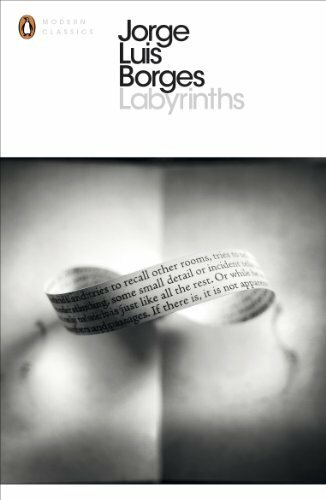 Labyrinths contains some of Borges’s best-known stories, such as ‘The Library of Babel’, which describes an infinite library and those who live in it; or ‘Funes the Memorious’, about a boy who falls from a horse, injures his head, and develops a perfectly eidetic memory; or ‘Tlön, Uqbar, Orbius Tertius’, about an encylopaedia which includes an article on a country which does not exist and triggers an obsessive search for more information by the narrator; or ‘Pierre Menard, author of the Quixote‘, which discusses an author who plans to become Cervantes in order to write a word-for-word copy of Don Quixote… The stories have a sort of dry, academic tone, almost reportage in places, but certainly a demonstration, much like I found Blixen’s Anecdotes of Destiny to be, that “show, don’t tell” is a relatively recent writing fad. 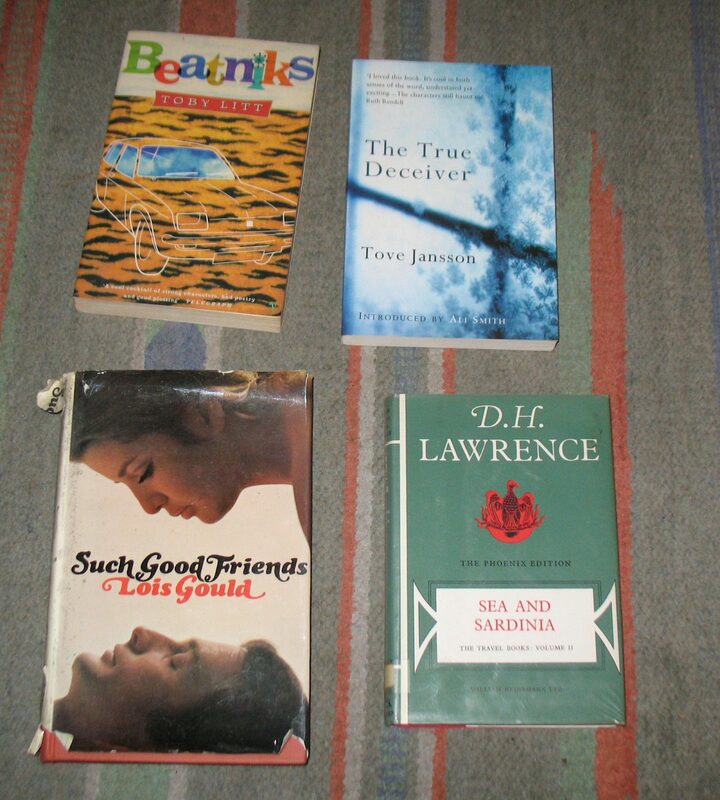 I particularly liked ‘The Immortal’, but ‘Three Versions of Judas’ read like uninteresting biblical scholarship. Labyrinths also includes ten essays and eight “Parables”. This is erudite, intelligent stuff, and while Borges is fully deserving of his reputation, I can’t see anyone writing anything like it today – at least, writing it and being published… Every self-respecting literature fan should have a copy of Labyrinths on their book shelves, real or virtual. Categories: book review, books, reading diary 2016 | Tags: brian o'leary, david karp, david tallerman, frank herbert, john dickson carr, jorge luis borges | Permalink.